Etsy hacks to save money on your next shopping trip. 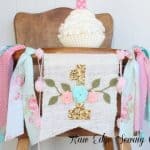 Are you as obsessed with all things Etsy as I am? Love all the unique and cool stuff you can find on Etsy? Like this ceramic unicorn figure from Barruntando or this first birthday high chair banner? But then you feel bummed because you don’t have the money to spend on it right now? Yup. I know how you feel. That’s why I started putting the items I love into my “favorite” list. Then something magical happened. I received emails from Etsy telling me my items that I favorited are now having a sale or is offering discounts. I’ve never received these emails before? 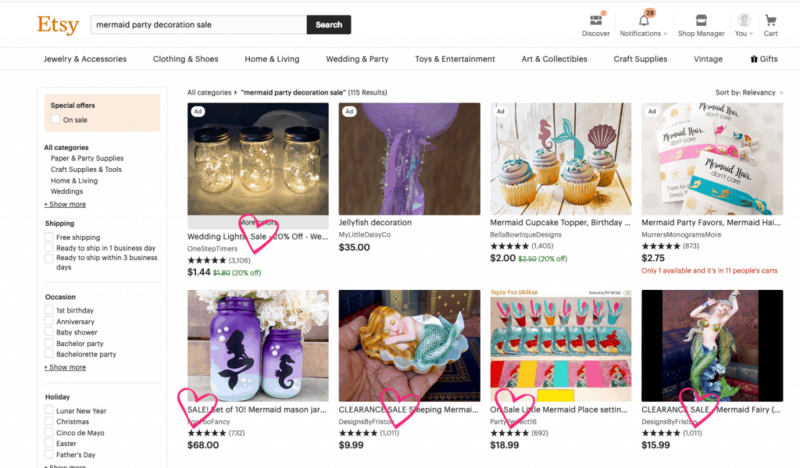 So I went into research mode and found all the goodies I can find into how the shops on Etsy do sales campaigns or promotions. Of course, as a seller on Etsy I also started implementing some of these special promotions in my shop as well. I’ve had fun finding items at a discount. And offering my buyers huge discounts as well! 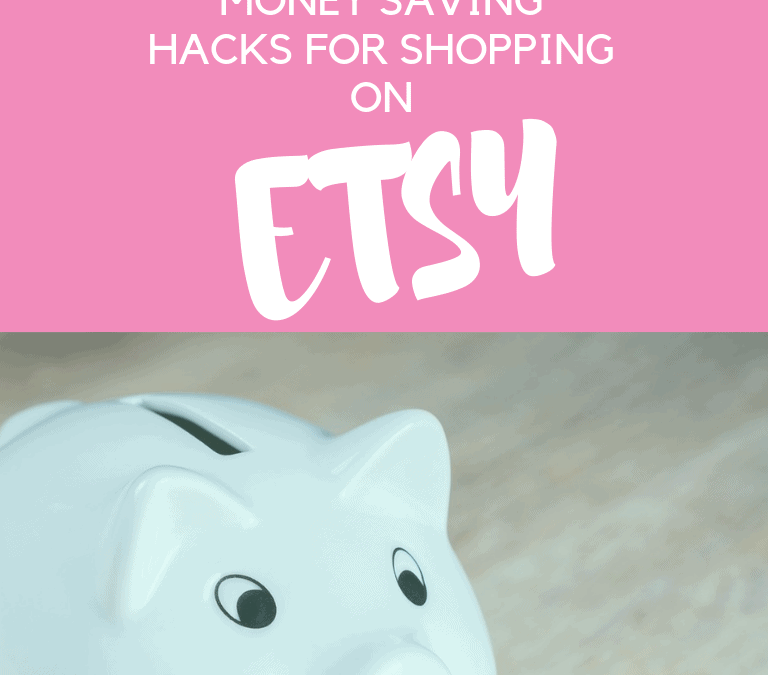 Here are the 9 money saving hacks for shopping on Etsy! If you love an item, click on the heart, which on your desktop is on the top right hand corner of the listing. Depending on the seller, you might receive an email with a promotion. I’ve seen 10% off to free shipping. Etsy hack #2. Buy your item off-season. I favorited some Christmas wreaths in November for this article that I was writing. Load and behold February came along and I started getting emails from Etsy saying this item and that item is on sale. So if you know what you want to buy for next Christmas, Halloween, etc, favorite that item by clicking on the heart. You might see a discount for it in the near future. It’s now March and I’m getting sales notice for Christmas stockings. Remember not all shops do this. 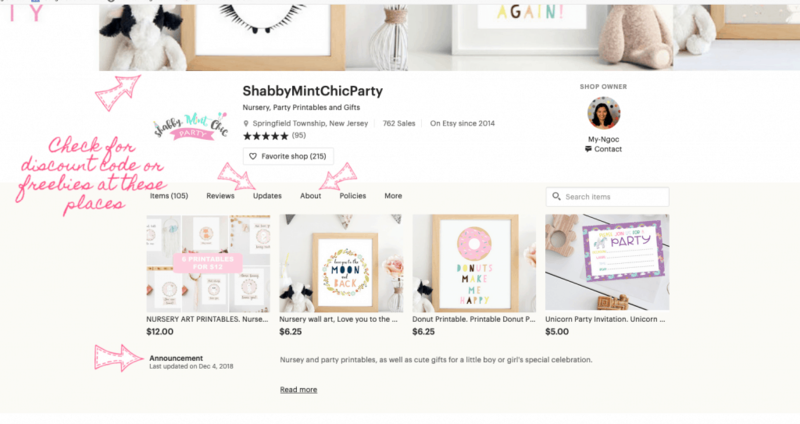 Sales and promotions are done by individual shop, not Etsy. If you are buying something that is one of a kind, you might not want to wait for a possible promotion. Etsy hack #3. Add that item in your cart. If you’re hesitant to buy it because it might be on sale later, add it to your cart. Wait for a day or two. You might get an email telling you you’ll get this at discount if you finish purchasing it. Etsy hack #4. Sign up for the shop’s newsletter. In the shop’s cover image. Not sure where these are? Check my image below. For example, if you sign up for my newsletter, I send you shop updates, free printables on my blog, newsletter members’ exclusive printables, and access to my printable library. New subscribers get 35% discount. That’s a lot of cool stuff. Here is what my newsletter opt-in look like. Sign up and see all the FREE wonderful things! So the next time you are on an Etsy shop, look for the newsletter link or a link to their website. From there you should see a link to sign up for their newsletter. Some sellers also sell more items at a lesser price on their own website. So take the time to find that website or the subscriber link and SIGN UP for the newsletter. 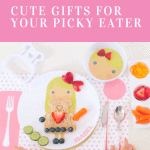 You can find these information in the same places as Etsy hack #4. Etsy hack #6. 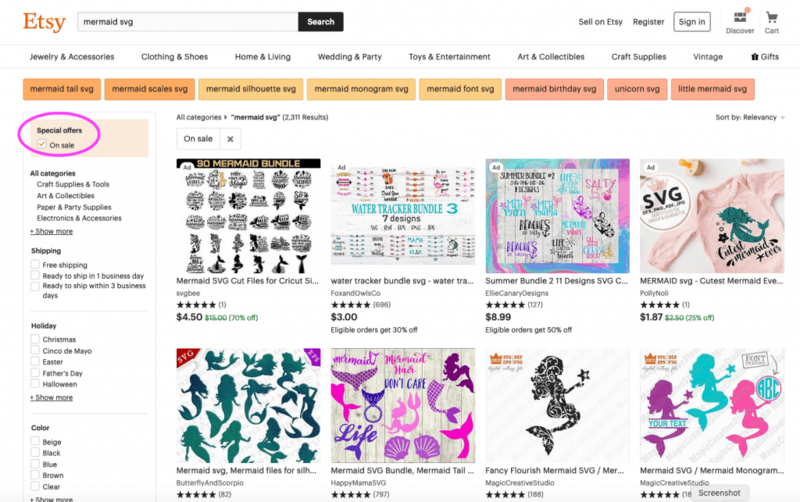 Find discount by using Etsy search function. Yup. You can just type in “discount”, “sale”, “% off” and whatever product you are looking for. Here is a screenshot of what I got when I search for mermaid party decor sale. 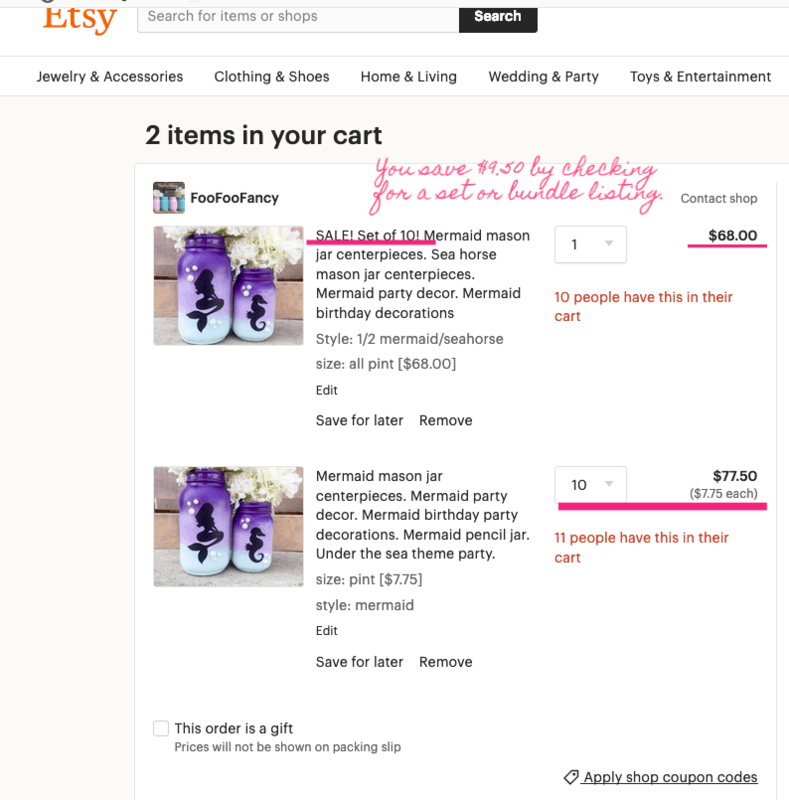 By the way if you write “sale mermaid party decor”, Etsy will somehow autocorrect it to SCALE. You won’t get as much sale listings that way! Etsy hack #7. It SAVES to read the product listing. I’m guilty at not reading the whole listing before hitting the “BUY” button then realized it’s not I was looking for. If you don’t read the whole listing you might miss out on the fact that you could have bought something for a lot less or even free! Some owners will tell you that the items are free if you use a link that redirects to their website. If you read the whole listing descriptions you might end up getting what you want and saving lots of money. Etsy hack #8. Buy in bulk. I don’t mean buying a lot of items from different stores. Individual store will offer a set/bundle deal. You can browse through the listings for one that says “SET” or “BUNDLE” like the listing below for the Mermaid mason jars. As you can tell from the image, buying a set of 10 mermaid mason jars is cheaper than buy 10 indvidual ones. Look through all the image listing pictures. You should go through every listing pictures because it will give you information about your potential purchase, but also how to get free or discounted items. You can find the information in the listing itself. It might say something on the line of “buy 2 get 1 free with code freebie”, “Looking to buy more than one? Click on this link!”. Remember to read the listing carefully. It really does pay off! Here is an example from my shop. 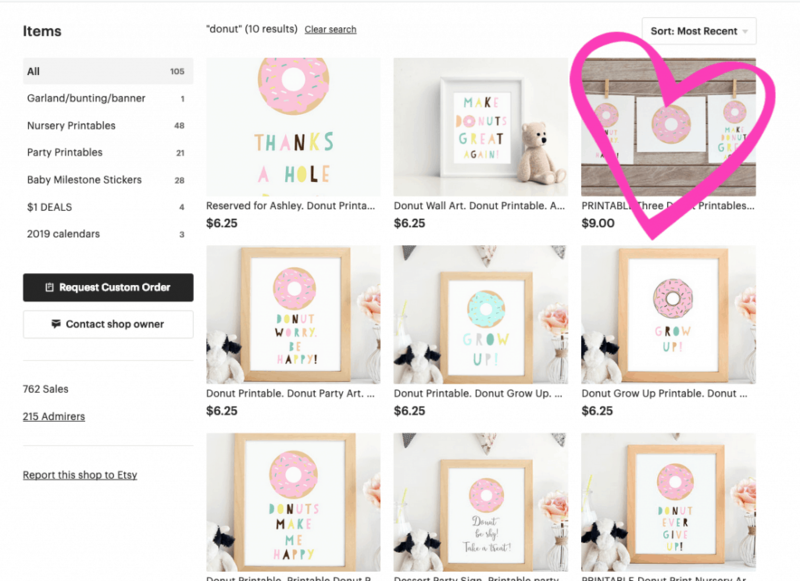 It’s not advertised as a bundle,but you can see that there is a deal for 3 donut printables for $9.00 compared to 3 for $18.75. Bear in mind, that you can use the 35% off code if you sign up for my newsletter for this $9 listing as well. If you don’t want to sign up, you might get another discount by just putting in your favorite list listing or leaving it in the cart. By the way, Etsy doesn’t let you use more than one code. So do all the hacks and see which one gives you the best bang for your buck! Lastly, you can find discount information right at the top of the main shop page in the cover picture. 9. Click “ON SALE” on Etsy search result page. Right before I hit published on this post, I found this one last hack. Just type in what you want, hit “SEARCH”, You’ll get a tons of results. Now filter them for sales items by clicking “ON SALE”. Your results will now only contain items with sales. Easy peasy. There you have it. Nine hacks for saving money on Etsy. Remember to do all the money saving hacks above on your next shopping trip. Do you have other tricks, besides emailing the seller and begging pretty please for a discount? 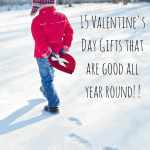 15 Valentine’s Day gifts that are good all year round! 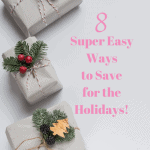 8 Easy Ways to Save Money For the Holidays!